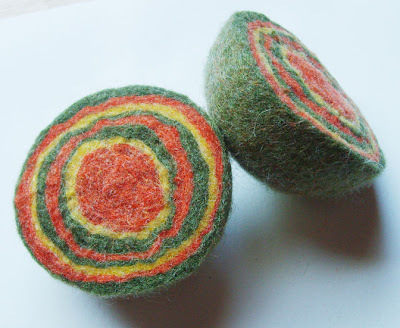 The Funky Felter: Handmade felt beads and more felt beads - Swirls, Sushi Style, and Geodes too! 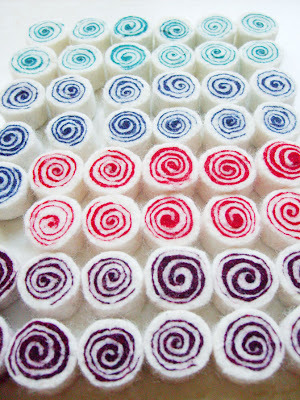 Handmade felt beads and more felt beads - Swirls, Sushi Style, and Geodes too! In an effort to keep busy and my mind off of other things during these last few weeks of my pregnancy, I've been cranking out handmade felted wool beads of all kinds. Although sometimes they can be quite time consuming to create, they really aren't that labor intensive compared to other feltmaking processes; therefore, it is something that I can physically do without overexerting myself too much. And, I've really enjoyed doing something creative everyday even if it is making something small like these beads. 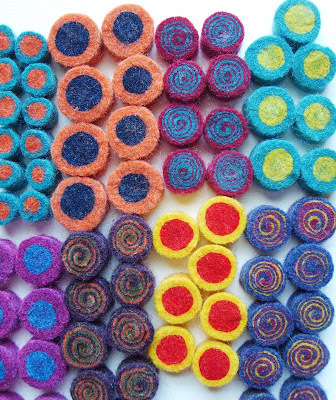 In the photos you can see some of my latest felted wool bead sets. I'm currently working on swirl and sushi style beads. The orange, yellow, and olive green geode bead was the last one that I made in a batch of twenty. You can see the other geode beads in my previous post. As with the other felted beads that I've made recently, I'm not quite sure what I will do with them yet. Most likely some will be sold in my Etsy shop as supplies when it reopens after the baby is born. Others will probably end up in some of my handmade jewelry creations and as embellishments on accessories. The possibilities are endless! For now, I'm focusing on making more beads and being as productive as possible while I wait for my little girl to arrive any day now. Best wishes! I hope your baby arrives safely and soon! !